What To Do If Your Child Is Bitten Or Scratched By A Rabid Animal? When Rabies Vaccine Is Not Needed ? When Are Vaccines For Rabies Essential? Rabies is a deadly disease caused by viral infection, which attacks human central nervous system. It is often spread through a bite or scratch from a rabid animal such as dog, cat, fox, bat, raccoon, skunk, ferrets etc. If a rabid animal bites your child, the first symptoms of the disease surface after long time gap. On an average, it can take about two months for the same. The virus has a long time to incubate. Thus the vaccine for rabies, administered to your child, can fight against the infection even after a bite. But if your child begins to show the symptoms, the progress for rabies is relentless. There are three stages of rabies symptoms in children. 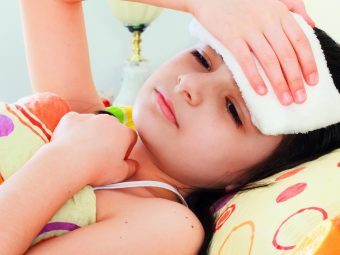 As each stage of symptoms progresses, it becomes much dangerous to the health of your child, sometimes it is fatal. The first stage of symptoms of rabies in children is called the prodromal period. Your child will experience many symptoms which might last from one day to four days. The symptoms that occur during this stage are similar to encephalitis. That is the inflammation of brain. This stage features some of the extreme symptoms. In regards to the progressive break down experienced by your child’s nervous system. During this stage, your child might slip into a coma stage and stop breathing. Normally, death occurs from four days to twenty days of this stage. When a rabid animal bites your child, you must clean the wound well. Rush to the doctor to find about which animals in that specific location are likely to transfer rabies. A medical practitioner would advise you whether rabies vaccine is needed or not, based on few rules. Your doctor would decide that your child does not need a rabies vaccine for a number of reasons. Observe the animal, which bit your child, for the next 10 days. If it is healthy and is hanging around in the vicinity, then it is not a rabid animal. If the animal is a pet in the neighbourhood and is immune for rabies, then your doctor may not advice the vaccine. Animals like mice, chipmunks, squirrels, rats and birds would not have rabies. Reptiles, fish and amphibians are also not infected by rabies virus. Your doctor would advise rabies vaccine for your child under various circumstances. If the animal is a new one in the region. If the animal, which bit your kid, is not observed for 10 days. If you are residing in an area where rabid animals are common. When you are observing the animal for 10 days and it shows one or more of rabies symptoms. The treatment would begin immediately. Animals living in the wild like raccoons, foxes, bats, coyotes, skunks, etc. might have rabies. Unvaccinated pets like cats and dogs might also have a rabies infection. The rabies vaccination are prepared by growing it in cells, happens in a laboratory. Generally, three variants of cells are required to develop rabies vaccine. As soon as, the virus develops in these cells, the cells are purified. Later it is treated with a chemical known as beta-propiolactone, which eradicates the virus completely. After the vaccine is administered to your child, it works in a remarkable way and is 100% effective. Four formulations with inactivated rabies virus. This vaccine is developed from the rabies virus. After it is cultured in the embryos of chicken and is later inactivated. This vaccine is processed, using the virus, which is grown in the cultured lung cells of fetal rhesus monkey. Later it is inactivated. RIG, is also known as, HRIG or Human Rabies Immune Globulin. It is produced from the serum of humans which have immense number of antibodies which can resist rabies. It is used along with the inactivated vaccine for rabies. The RIG vaccine offers immediate but short term protection against rabies. With the foray of technological advancements in the field of modern medicine, the side effects of rabies vaccine have decreased considerably. As a parent you must remember, that side effects tend to differ based on the vaccine type. When vaccine is administered to your child, the series must not be interrupted owing to these side effects. Reddishness with pain and swelling in and around the injection area. Headache, muscle pain, nausea, abdominal pain or dizziness. Joint pain, hives and fever. A rare illness known as Guillain-Barre disorder, triggers temporary paralysis that lasts less than 12 weeks. 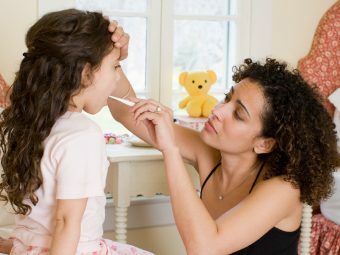 If a rabid animal bites your kid and if your doctor advises to get a vaccination, prepare your child for the vaccine shots. Ease his/her fear for injections by explaining its benefits and how it prevents him from getting sick. We realize this situation would be tough for you and your kid, but make sure you stay strong and be the pillar of support to your child throughout these days. Do share your experiences with other parents here.